Anyone in any kind of leadership position needs to master the skill of adept thought and speech in stressful high-pressure circumstances. In my work as an executive leadership coach with clients that include top leaders around the world, it’s an area I’m asked about often. Here are some tips and tactics to help you think on your feet. The secret is to be prepared: learn and practice a set of skills you can rely on in situations that put you under pressure. Repeat what you just heard. One of the hardest parts of contributing to a conversation is answering a direct question, especially when you can’t honestly give the expected answer. Allow yourself to pause and think; don’t feel that you need to fill the space with words right away. A tentative or uncertain reply won’t help your case. To calm your nerves and buy yourself a little time, simply repeat the question that was asked. As an added benefit, you can double-check your understanding of the question. Always be thoroughly prepared. Plenty of highly intelligent people aren’t good at speaking spontaneously, but with enough preparation you can still be brilliant. Learn every fact and figure, every prominent person in your field and their perspective, the background of the issue. A prepared mind is a smart mind. Learn to organize your thoughts. Constantly ask yourself the following questions: What do I not understand which could be better clarified? What question could I ask that would advance the discussion? What perspective or insight do I have that’s shareable? Don’t worry about being the smartest—sometimes it’s best to be the most organized and effective. Project confidence. Adept thinking in the moment boils down to self-confidence. Speak in a strong voice, make lots of eye contact, and keep your tone and body language positive. Remind yourself how much you know about your job, your organization and your industry, and how many people you work with successfully. Summarize and stop. Wrap up lengthy responses with a quick summary statement. After that, resist adding anything more. Be silent. Pause and allow people to fill the silent spaces. They’re absorbing the information you just presented, and speaking during that time can cause confusion. Lead from within: When you have to think on your feet and you want to sound smart, make use of the tips to help alleviate the pressure. 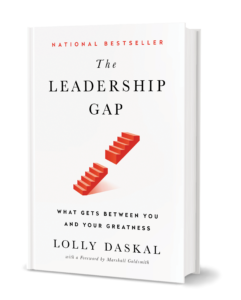 The post How to Think on Your Feet When You’re Speaking Under Pressure appeared first on Lolly Daskal. We all have irrational thoughts, often without even being aware of them. But these irrational thoughts keep us from the success we deserve and the happiness we want. Once you’ve identified an irrational thought, the next step is to break it down and replace it with a positive rational belief. Here are 12 of the most common irrational thoughts, which can victimize even smart, rational people. If even one of them sounds like you, do whatever it takes to find a better way to think..
1. I must be competent in everything or I will never succeed. If you think you have to be competent in everything to succeed, you are setting yourself up for failure. You don’t have to be an expert in everything. Your strength lies in what you know, not in what you don’t. 2. My emotions are outside of my control. If you think have no power over your emotions, try to think in terms of educating yourself about those emotions. It’s possible to learn to manage your feelings–and in the meantime, however you feel, you can always control how you act and respond. 3. I can never make a mistake or I’ll be seen as a failure. If you think mistakes are not an option, think again. Mistakes happen and they happen often–and our mistakes have the power to turn us into something better than we were before. So instead of thinking you can never afford to make a mistake, know that mistakes are not only useful but necessary. 4. I must please others to feel good about myself. This belief is a certain way to set yourself up for failure, because no one can please everybody all the time. The only person you can please is yourself–and if you are happy and confident in yourself, that is where everything will begin to work for you. It’s nice to have other people like you, but it shouldn’t be at the top of your list. 5. If someone criticizes me, there must be something wrong with me. When you’re the object of criticism, always ask “Is this about me or is it about the person speaking?” Criticism may mean that you see things differently or have different opinions. The secret is not to take it personally and allow them to be what it is: just someone’s opinion. 6. I will never measure up to others so I should give up trying. If you think you’re not measuring up, remember it’s a feeling and doesn’t necessarily reflect reality. We sometimes struggle with insecurities because we fear being judged–but if you spend your time focusing on your strengths and building your confidence, you’ll be better able to hold your own. 7. If I do things for myself I’ll be considered selfish. If you pride yourself on always helping, enabling, fixing others, it may feel like you’re doing something wrong if you spend time and effort on yourself. But sometimes you have to focus on yourself to be selfless, because if you lose yourself you will only become a reflection of what everyone else wants you to be. 8. I must never take risks to make sure I don’t fail. if you think not taking risks will protect you, think again. The biggest risk you can take is never taking risks. In the world of business and leadership, everything changes quickly and the only strategy that leads to success involves taking risks. You don’t have to risk everything, but you do have to risk. If you win you’ll be happy; if you lose you’ll be wise. 9. If everything is going right, something will go wrong. When times are good, we tend to wait for the other shoe to fall. Nothing will ever be 100 percent right or 100 percent wrong; there will always be an ebb and flow between the two. It’s finding the balance to know that everything will be all right, but that doesn’t mean perfect and it doesn’t mean that things will always be the same. 10. I don’t deserve success. Thinking of yourself is unworthy is as irrational a thought as you can have. You must believe that you are worthy and you deserve the success you’re working for–no matter what you’ve done or haven’t done. Learn to accept yourself and allow yourself to feel deserving. 11. It’s easier to avoid problems then to deal with them. Unfortunately, failing to deal with problems doesn’t actually let you avoid them. The more you try, the more they persist. There’s no point in trying to run or avoid or deny or evade them. Remember, a problem is a chance to do better the second time around. 12. My past controls my future. Only if you let it. The past is there to teach you, and once you’ve learned its lessons you can apply them to the future–but that doesn’t mean they have to take residency there. Learn to let go so you can move on to the next chapter of your life. Stay in touch with your inner voice so you can root out your own irrational thoughts and replace them with positivity and growth. The post 12 Irrational Thoughts Even the Smartest People Have appeared first on Lolly Daskal. I’m sure you have heard these things before, especially now in an age when positive psychology is so popular: Choose to be happy. Visualize your success and you will be successful. If you believe it, you can achieve it. They’re nice messages, and they’re everywhere. But scientific evidence suggests that they may not actually be helpful when it comes to achieving our goals and being successful. Instead, more than 20 years of research by New York University’s Gabriele Oettingen suggests that positive imagery can backfire on us. It can trick the mind into relaxing, making it harder for us to get our work done. Negative thinkers are tuned in to the challenges ahead. Thinking about future obstacles helps you begin planning strategies to overcome them. When you’re telling yourself everything will work out, you aren’t planning. Negative thinkers have a competitive advantage in the face of difficulties. Negative thinkers are two steps ahead of everyone. They think of solutions before the problem even appears. You cannot stop the waves, but you can learn to surf. Negative thinkers undermine complacency. When most people expect everything to go as planned, negative thinkers are making a list of all the things that can fail. They’re rarely caught off guard, and they always have a plan B. Negative thinkers aren’t so much pessimists as hard-edged realists. They can see not only problems but also opportunities before they arise. They’re skilled at turning failure into lessons. They know how to cut through the bull and wishful thinking to see what’s actually happening in front of them. So maybe the negative thinkers on your team have more value than you’ve been giving them credit for. Remember, every point of thinking has value. The post The Surprising Power of Negative Thinking appeared first on Lolly Daskal.